There are many people that would want nothing more than to just lose weight and keep it that way. So, the word “calories” has been talked about a lot lately. Calories in, calories out – good calories, bad calories – a calorie is just a calorie – there are dozens of sayings about this. But what if we were to tell you that these people’s focus is set in a wrong place. Calories are indeed very important – but not as nearly as important as eating healthily and doing adequate exercise. You don’t have to count calories – in fact, we advise you against it. You will be able to dramatically improve your health if you’re just mindful of the two things that we have mentioned – exercise and diet. As for the exercise end, we suggest that you try learning Muay Thai. You can go and visit a Muay Thai training camp – this is a great idea for all men and women. Muay Thai is one of the most powerful exercise methods that you can find out there. That being said, you need to be prepared to put the work in. If you don’t do this, then you won’t get any of the benefits associated with vigorous exercise. Also, you will have to be a bit courageous when it comes to Muay Thai, at first. This is because this martial art has to do with violence and many people are naturally and expectedly afraid of violence. But if you really wish to master your own fears – then Muay Thai is the perfect challenge that you can take no matter who you are. Above all else, you will manage to lose weight and improve your health. And this is what you were after all along – this much is clear. We hope that you will have a grand time while training Muay Thai, indeed. 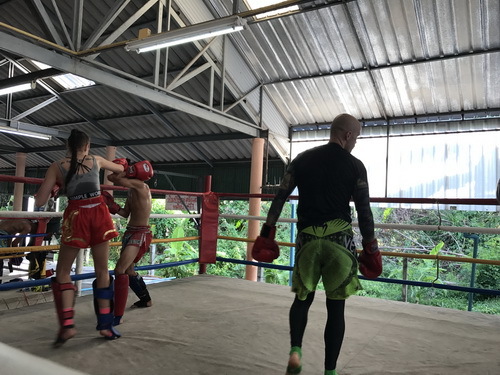 There are dozens of different reasons as to why we suggest that you should train Muay Thai – but we have mentioned the most important ones already in this article. So, it’s now up to you to go and train Muay Thai and get the benefits that we talked about.